Yarden Children’s Enrichment Centre is a centre for kids with special needs. This centre opened its doors in January 2015 and their aim is to provide a warm and nurturing environment, in which the child feels secure and at peace. They strive to unlock the potential of each child on an individual level. Reaching a child’s full potential by working together as a team with professional carers, parents and therapists. D4D contributed R15,000 towards the centre which was paid to them over a 6-month period. D4D also made a difference in a more practical way, by purchasing a vacuum cleaner for the school. HELP was born through the realisation that there are so many children in South Africa who are illiterate. HELP assists the children of Heathfield Primary and Thomas Wildschutt Senior Primary School with their homework as a priority. When they do not have homework, HELP gives them fun exercises in English and Maths. HELP also offers art, sport and games to keep the children interested and focused. In 2017 they identified the need for an additional qualified teacher who could assist with the preparation of lessons and giving more challenging work to the children. D4D’s board of directors approved a sponsorship of R48,000. Another corporate sponsor, Pragma, came on board and they agreed to support them with an additional sponsorship of R24,000. It was agreed that the combined sponsorship would be utilized towards the salary of a new teacher. A qualified remedial teacher was appointed and her full salary was covered by the D4D and Pragma sponsorships. Ubuntu House provides temporary safe care for newborn babies, given up by their mothers from unwanted pregnancies, rejection due to HIV or being abandoned. Since their opening in 2003, they have cared for 586 babies and placed 473 with adoptive forever parents and 100 were also reunited with their biological parents. D4D’s board of directors approved a total sponsorship of R42,000 for 2017 (a monthly sponsorship of R3,500). Esther van Zyl is a foster mother to two children, aged six and two. The six-year-old boy was found in a shack in Langa, where he was left without food for four days. He was very ill and amongst other serious health issues, he was diagnosed with HIV. The baby girl was born in a park, next to Esther’s daycare-center. Esther met her when she was five days old and she has ever since been with her. In March 2017, D4D approved a total sponsorship of R36,000 and by doing so supported Esther with a monthly amount of R3,000 over a 12-month period. This sponsorship was utilised to buy clothes, nappies, milk and medicine as and when needed. Hagar’s Choice stepped up to provide a service to their community by starting a place of safety in 2014, due to a great need for a place of safety / foster parents / Kangaroo care for babies who are awaiting adoption. Hagar’s Choice is a family-run safe house. This family consider the babies they look after (mostly 0-6-months) to be part of their family and they believe they should be treated as such. After D4D visited Hagar’s Choice and gave feedback to the board, it was decided to support them in a more practical way. We bought them Dischem vouchers to the value of R10,000 which allowed them to buy milk and nappies for the babies. D4D has been supporting this family for the past two years. They have four children of their own. In 2016 they were told about two girls who were in danger and in need of emergency intervention. God assured them that He was calling them to be His voice to the two children. They registered as a place of safety within two weeks. Suddenly six little people had to be fed, dressed and taken care of. Not only was the logistics a new challenge they had to face, there were other challenges like emotional and social deficits and they required a lot of individual attention. D4D contributes to this family with a monthly donation of R3,000 and will continue to help as long as we can, to play a part in these two girls’ healing process. This family has been caring for children at risk, in their home for the past 6 years. During this time, some moms needed a place of safety for themselves, as well as their babies. It was in 2013 that they decided to formalize their efforts with the registration of The Living Hope Foundation. Two years ago, they got involved with Family+1, an outreach initiative of the Hillsong Africa Foundation. Through their training, they got a better understanding of Temporary Safe Care and Foster Care. As a result, they are now registered with the Department of Social Development as a Temporary Safe Care Home. Since then they have had a number of babies placed in their care. Last year they were asked to become foster parents to a little girl Kyla, who was later successfully adopted by an overseas couple. After her adoption, they felt led to start Project Isibali, through which they will directly campaign to be a voice for the voiceless, addressing the plight of the thousands of abandoned children in South Africa by placing them with adoptive parents. This they will mainly do in their local community through existing church congregations. D4D’s board of directors approved a donation of R9,000 to this family. This was paid to them over a 6-month period. The Imibala Trust is a NPO that was formed with a clear mandate of facilitating partnerships to identify the neediest school-going children in South Africa; to secure quality and fitting school uniforms for these children; and to monitor the impact of that intervention over a period of time. It started in 2002, with 58 children receiving sponsorships. The number of sponsorships the Trust facilitates has steadily increased to around 2,000 per year. In December 2017, D4D donated R12,000 to the Imibala Trust. This donation enabled them to sponsor ten children from Solomon Qatyana Primary with brand-new school uniforms for 2018. The Spirit Education Foundation celebrated its 23rd year of existance in 2017 and continue to flourish in many ways. Their dedicated team of scholar facilitators ensure that all their scholars are mentored, cared for and encouraged to perform to the best of their ability. One of their scholars who matriculated in 2017 at Paul Roos Gymnasium, is the 18-year-old Daniël Frank. He has been in the care of his foster mother, Sylvia Frank, since he was just two days old, after being abandoned in the street. In 2017 D4D and Pragma contributed towards his school fees as well as Additional Math classes. D4D started supporting Sylvia’s House financially more than eight years ago. With the help of Pragma and D4D, Daniël was D4D’s first student who successfully completed his scholarship through the Spirit Foundation. We wish Daniël only the best and will support him as much as we can. 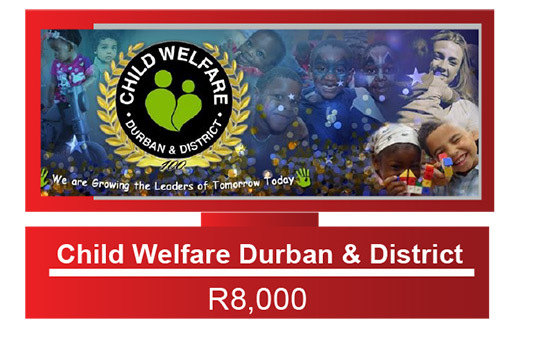 Child Welfare Durban & District is a registered NPO whose core objective is child protection. Child Welfare Durban & District aims to make a difference in the lives of children who have been sexually and emotionally abused, neglected, orphaned and abandoned. They have nine community family homes, catering for 54 orphans whose family ties have been severed. In April 2017, CWDD applied for funding through D4D. They were in need of new beds for one of the children homes. D4D contributed and bought three double bunk beds with six foam mattresses, a kettle and a toaster for the home. D4D’s partnership with them helped to transform the communities they serve. Since 2016 D4D has been involved with Kingdom Kids Crèche, in Sir Lowry’s Pass. D4D funded their construction project in 2016 with the erection of a new classroom and ablution facilities. Kingdom Kids was started in 2009 with only two children and have since grown to 65 children. The school has limited funding and not all parents are contributing to school fees. Financially it puts incredible strain on them. In 2017 the school was robbed and D4D decided to install burglar bars to prevent this from happening again. D4D also bought nappies and wipes for the school, because they had nothing left after the burglary. In December 2017, D4D surprised them with a Christmas party. Each child was blessed with a small gift and a party pack filled with sweeties. Charlton Pienaar is a 5-year-old boy who was diagnosed with spinal TB when he was only 2 years old. He is currently living with his grandmother. His mother is a drug addict and his father comes and goes as he pleases. He can’t walk and he has no control over his bladder and therefore is permanently on nappies. The Board approved an amount of R2,000 to buy nappies for Charlton. This family’s two children were on their way back from the Western Cape Regional Table Tennis Competition in Oudtshoorn, only to find out that their home burned down completely. The only clothes they had left, were the ones they took with to the tournament. The Board agreed to buy them Checkers vouchers to the value of R2,500 which enabled them to purchase a few necessities for the children. Mia Cara Ferreira was diagnosed with acute lymphoblastic leukaemia at the age of three in 2015. After 21 months of intense chemotherapy, lumber punches and bone marrow biopsies, her parents received the devastating news in May 2017 that she relapsed. However, there is HOPE. Hope in the form of (CAR) T-Cell therapy being developed for the treatment of cancer in the USA. The Hope for Mia Cara Fund was formed by a group of friends of the family who aim to raise R10 million for Mia’s treatment. D4D contributed R5,000 to the fund. D4D has been supporting Sylvia’s House in Gordon’s Bay since 2009. Currently Sylvia is fostering nine children, the eldest 18 and the youngest 13. D4D currently supports them with an amount of R10,000 per month. Sylvia’s heart and head are all over the place when she looks at her children and remembers how their lives began and how much they have had to overcome emotionally. She is proud of what they all achieved so far. It was pleasing for D4D to have witnessed every child’s growth and accomplishments over the past year. Originally, back in 2005, D4D’s involvement with foster homes started out with Tzadokah Foster Home. We currently support them with an amount of R10,000 per month. This ensures that all six children can attend school. We are so blessed and thankful to have Tina Barthus as the foster mom. The children adore her, and truly experience family life in all its aspects. The ages of the children range from 5 to 18. One of the children has an enormous challenge with regards to his reading abilities. To rectify this problem, D4D is sponsoring him to attend extra reading lessons at Tina Cowley Reading Centre. He has made gigantic improvements over the past year and has grown in confidence in his reading abilities.